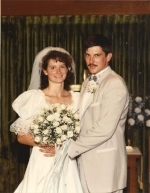 As I write this my husband and I recently celebrated our 30th wedding anniversary...it is a miracle we made it past 17 years as we nearly divorced. Saying wedding vows may come easy but marriage is hard. Marriage is supposed to be a lifelong covenant you make to one another, in sickness and in health through all challenges including financial. I am forever grateful that I have a husband that continues to honor those vows. My medical challenges over the years have been difficult on me and my family. For those of you that read my book, A Mother's Climb out of Darkness, you know that I would not be alive today without my faith as well as the dedication and support of my husband. I am forever grateful. The difficulties of my health challenges is what nearly ended our marriage in 2005 but thankfully, I found peer support, which was essential for me as it helped change the course of my recovery. Renewing our wedding vows in 2008 at 20 years was important. Life was going well at that time and did for quite some time after but more recent years have been difficult. I have learned it is essential to not give up on someone you love even when you may not like them at times. Keeping communication open and honest is critical to any relationship but especially marriage. As I am learning to navigate my recently entered perimenopausal/menopausal years, I must have patience with myself and my loved ones, who are doing the best they can to understand while dealing with their own life circumstances. In my opinion, marriage requires a dedicated love that needs to remain present despite circumstances. Lots of prayer and good counsel help too. We can not predict the future but we can be certain that life will not always be easy. When you commit to keeping your promises to each other, you can navigate the difficult times together while cherishing the joyful and good times as well.